Whether it’s bags or dark circles, we all know the feeling of waking up and looking like we haven’t slept at all. Today, we’re going to share with you the products we love and our tips for erasing puffiness and hiding those dark circles to achieve a well-rested look. I was lucky enough to be genetically blessed with chronic dark circles under my eyes, so covering them up has always been a struggle for me, and I’m always looking for something new to try. I have a huge list of products that I’ve tried and haven’t liked, but for the sake of this post I’m going to focus on the one I’ve had the most success with. BareMinerals Well-Rested Eye Brightener is by far the best product I’ve used to hide my dark circles. The title sort of says it all. It goes on light and doesn’t cake into the fine lines under my eyes. I can still remember the first time I put it on and I couldn’t stop staring at myself in the mirror. I was in awe. I am in love with Almay Smart Shade Anti -Aging concealer. I apply it every morning under my eyes before applying my foundation. I put a small amount of the product on my pinky finger, and start applying at the inner corner under my eye and working out, adding more in the darker areas. I then blend the concealer with a continuous dabbing motion while still using my pinky finger. You do not want to be rough with the skin around the eye area. The skin is very fragile and using the light touch of your pinky finger can help prevent unwanted wrinkles. 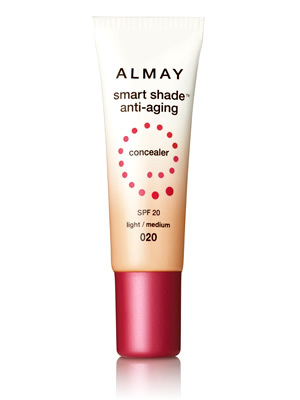 The Almay Smart Shade concealer is very moisturizing, fights signs of anti-aging and has an added bonus with 20 SPF! A definite must here in south Florida! It definitely does the trick for me and always leaves me looking bright and well rested! When looking for an undereye concealer, try to find a color that’s a little bit lighter than your natural tone. Also, if you have dark, bluish circles, it helps to find a shade with a bit of a yellow tint to it to help balance the tones out. Use a highlight color (I just use a white, shimmery eyeshadow) in the inner corner of your eye near the tear duct and also just below the outer half of your eyebrows. This really helps brighten and open up the look of your eyes. When applying a liquid concealer, use little dabs of the product and tap repeatedly with your finger rather than rubbing to help blend the product in better. Use extra care when applying product around your eye. The skin is very delicate and you do not want to cause premature wrinkles.